Who’s ready to paaartttaay?? All paws are pointing to this guy! 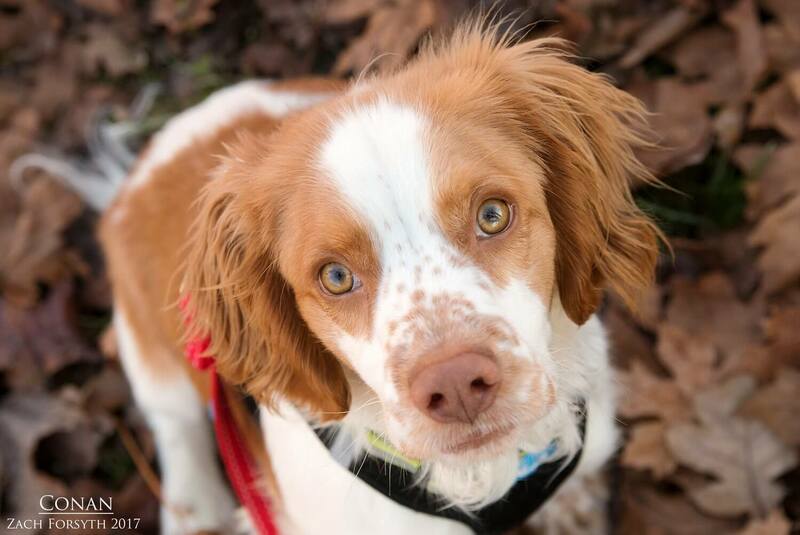 That’s right, my name is Conan and I am cute, adorable, and spazzy 8 month old Brittany Spaniel. Right now, I weigh about 25lbs, but I still have a little growing and filling out to do. I am just so excited and ready to do things all the time! Play with toys? Check. Go for a hike? Check. Play with my puppy pals? Double check! I am a friendly, energetic pup who needs a very active lifestyle and family with kids over 10. In fact, I really enjoying running around and am very food motivated. Which means with some training, I could be a great running partner! I still need to learn the basics, but I am a very quick learner and am already working on “sit”. PUPPY CLASSES ARE REQUIRED FOR MY ADOPTION. Being a field spaniel, I really enjoy a lot of space to stretch my legs, so the apartment life is not for me. No kitties in my home please. So what shall we do next? Run on the beach? Swim in the lake? Climb Mount Everest? The possibilities are endless! Fill out an application today, so we can meet and start our journey together. I come to you neutered, vaccinated, and micro-chipped with an adoption fee of $400.